When you love corn but hate corn-on-the-cob, it’s time to get creative. Which is super inconvenient, really, because most fresh corn seasons find me in the heart of New England where it really is as high as an elephant’s eye. And corn is a thing. God, how it is a thing here in New England! There is the lengthy discussion over which pay-what-you-like-in-the-coffee-tin farm stand has the best corn. There is the endless debate about how to fix it, solved for me by my good friend Skippy, who taught me that wrapping it in foil with butter and a ton of salt and roasting it is hands-down the best way. There are the cutesy little corn-on-the-cob skewers that everyone gives everyone else as houseguest presents, which always — always — go down either the disposal or the main drain of the dishwasher by mistake. And then there is the fact that although everyone professes to adore corn-on-the-cob, those same everyones are somehow never ever around when it is time to shuck, which inevitably involves those incredibly elusive little slippery strands. But I do love corn. Go figure. I love corn ice cream (all the rage last year), I love polenta, which is basically corn, I’m borderline obsessive about my cast iron skillet cornbread, and I love corn relish and salsa. So what I don’t love is the mess involved in eating of corn-on-the-co. If I’m honest, I feel the same way about lobster — only ever really enjoyable in my oldest T-shirt on a porch with a table lined with yesterday’s newspaper. Corn, apples, and tomatoes are the troika of autumn in New England. Raging tomato snob that I am, I spend much of late August and September dining on all manner of tomato dishes. In New England, I’m lucky enough to live down the road from a beautiful pick-your-own-apple orchard, which doubles as a sculpture garden. 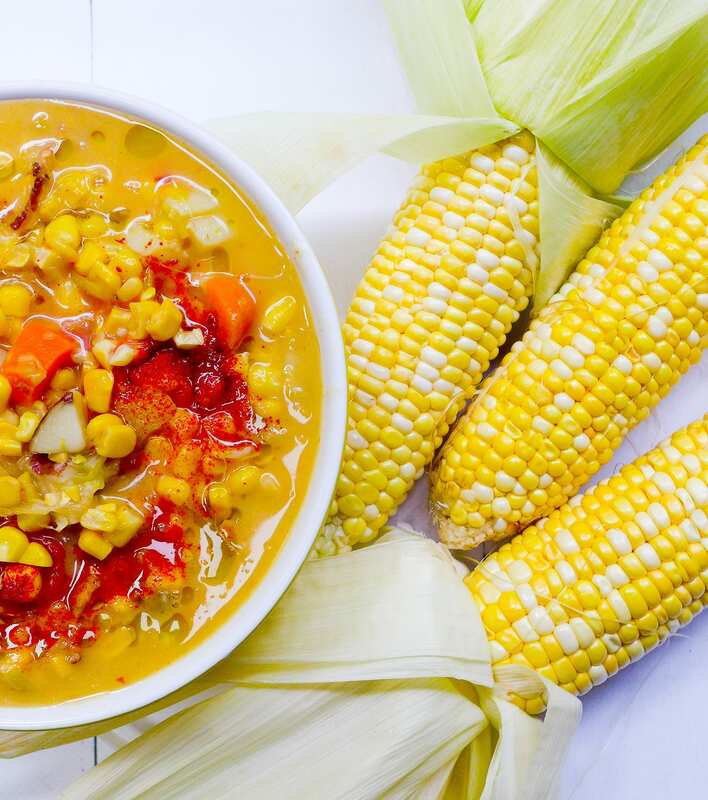 But finding a way to enjoy corn off the cob proved elusive until I created this recipe for creamy corn chowder. 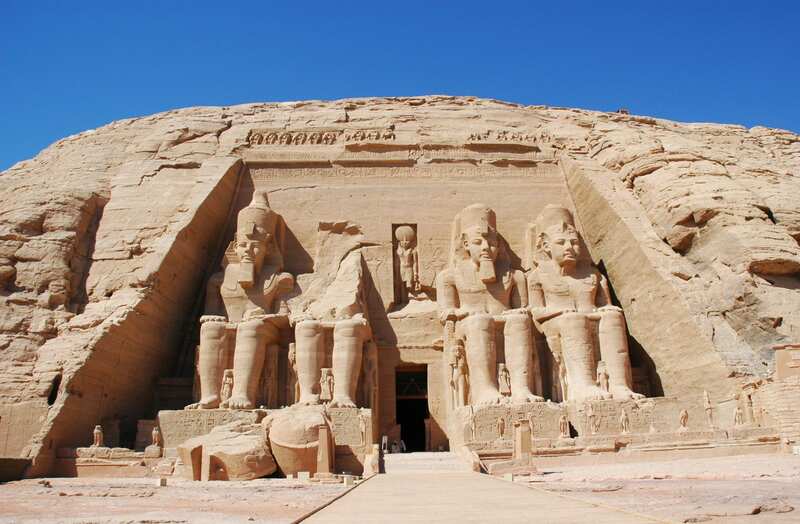 Subscribe to receive updates when posts like this one are published. It began far away from New England. After one of our legendary grilling nights in Moscow, I ended up with a ton of extra roasted ears of corn in foil. Poking around in the fridge, I found potatoes and carrots and some bacon ends, and this chowder was born. Over the years, I’ve refined and honed it, and it has become a firm fixture in our optimistic early autumn line up. This soup can easily be tweaked to vegetarian and even vegan if you omit the bacon and/or the cream (substitute coconut milk for the latter). 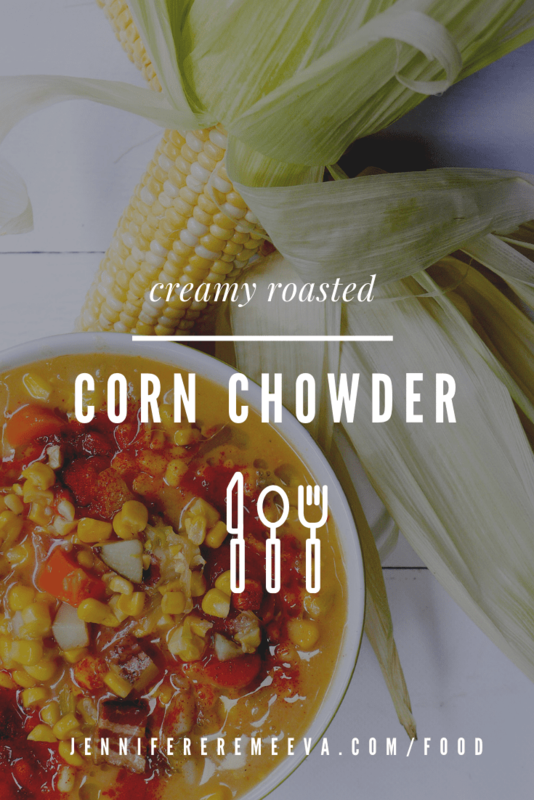 It freezes well, so while they are paying you to take the corn away from the farm stand, go ahead and indulge in a lovely vat of this creamy, corny soup! Preheat the oven to 425℉. Adjust the rack to the middle of the oven. Melt the butter and brush onto the corn, then season generously with salt and pepper. Arrange the corn ears and cubed carrots on the lined baking sheet and cover with foil. Roast for 30 minutes. Let cool to room temperature. Slice off one end of each ear, then use a serrated knife to remove the corn from the ears. Place the denuded cobs in a pot with the chicken or vegetable stock and a few bay leaves and simmer for 1-2 hours. The broth will then be infused with a delectable “corny” flavor that will make the soup even better! Do not despair: this recipe is just as good — well, almost. Corn is frozen at the peak of its freshness so your soup will not suffer. Do roast the kernels with the cubed carrots, though — this step makes all the difference. Drizzle with the same amount of butter and salt and roast for 10 minutes. Put 1 cup of the accumulated corn kernels to one side. Place a large heavy-bottomed soup pot on medium-low heat. Fry the bacon cubes until crisp. Remove the bacon to drain on a plate lined with paper towel. Discard all but 2 Tbl of the accumulated bacon fat. Sauté the onion and garlic in the bacon fat until soft, adding 1 tsp of Aleppo Pepper as you do and a good pinch of salt, then add the celery and sauté for another 3 minutes. Add the white wine and simmer until the liquid evaporates, using the back of a wooden spoon to collect up all the lovely bits on the bottom of the pot. Add the potatoes, the remainder of the corn kernels (you’ve set one cup aside, remember? ), and sauté for 3 minutes. Add the can of creamed corn and the corn-infused chicken or vegetable stock. Stir to combine, then bring to a gentle simmer. Cook covered over low heat for 25 minutes, or until the potato cubes are softened. Pass the soup through a colander set over a large pot or heat-resistant bowl. Place half of the corn/potato chunks and half of the liquid into a blender and process until smooth. You can also use a hand-held mixer, food processor, or food mill to achieve the same effect: to blend the ingredients into a thick consistency. Return all the ingredients to your original pot. Add the carrots, half the bacon, and the chopped parsley. Stir to combine and simmer very gently for another 10 minutes to allow all the flavors to cozy up. The soup is now ready to serve. Finish it with a generous dollop of coconut milk or cream in each bowl. 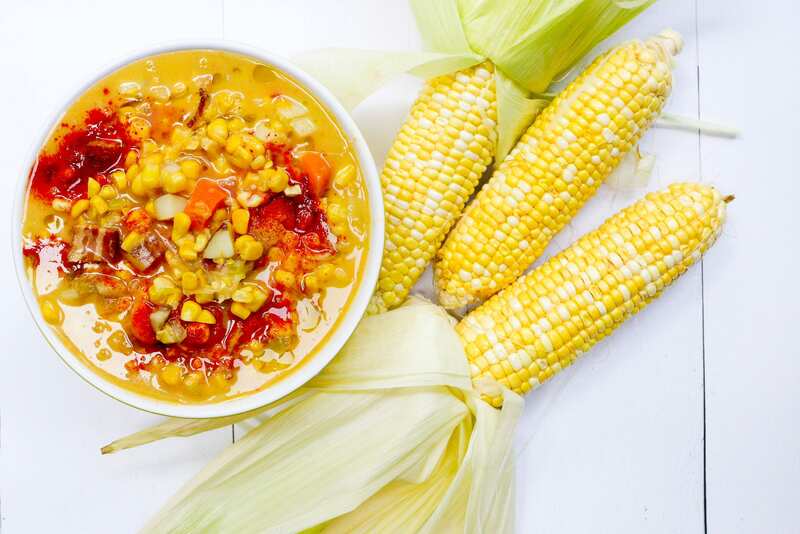 Drizzle the soup’s surface with a bit of olive oil, then garnish with the remaining bacon, corn kernels, and the other ingredients suggested above. If you don’t have a blender, you can use a hand-held food processor, food mill, or pass the solids through a fine sieve with the back of a wooden spoon. It's very simple to make this soup vegetarian and even vegan if you omit the bacon and/or the cream (substitute coconut milk for the latter). This soup is a real trooper — hearty enough for a meal when paired with a nice crusty loaf and some butter. It freezes wonderfully, and it is also mild enough to be a superb base for more protein options such as shrimp, clams, or more bacon. Enjoy! If you are somewhere where you can't find creamed corn, substitute another 1-1/2 cups of corn, whizzed in a blender with 3 Tbl of milk and 1 Tbl of melted butter. Thank you for visiting and enjoying another delicious food post! Do you hate corn-on-the-cob? If you make this recipe and post to Instagram, use the hashtag #cookingwithjennifer so I’ll be sure to see it !